The War of 1812 Memorial, also known as the "Old Soldier," in Victoria Memorial Park. City of Toronto Archives, Fonds 1257, Series 1057, Item 188. 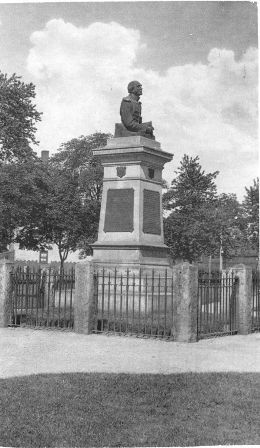 On the west side of Portland Street, between Wellington and Niagara, sits Victoria Memorial Park, and within this park sits Toronto’s monument to those who served in the War of 1812. Underground lie the remains of several hundred early residents of the area, including many soldiers, buried between 1794 and 1862. Once begun, the process of converting the cemetery into a public park and erecting the cenotaph took multiple decades; it has been frequently been the site of neglect and vandalism. 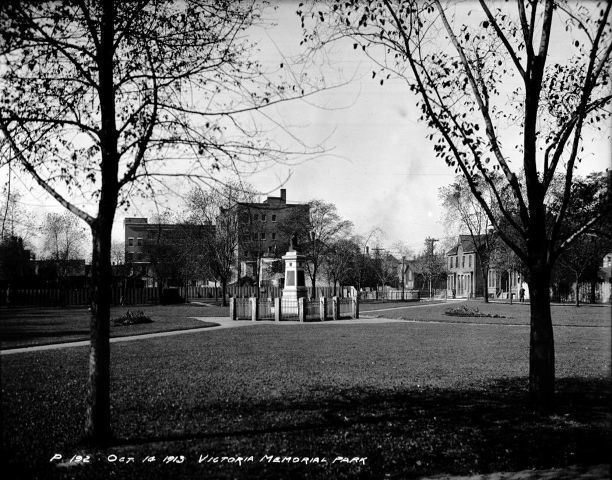 Over the years, the site has been known by a variety of names, including Victoria Square, St. John’s Square, Portland Square, and Military Memorial Park. 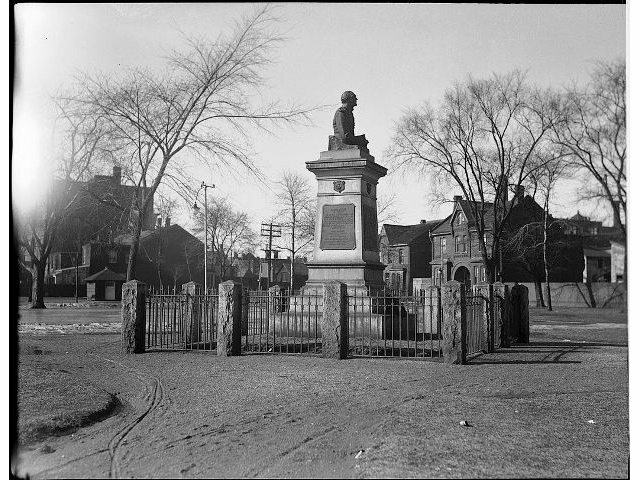 Before it was a park at all, the site was known as the “Military Burying Ground,” and was the first British cemetery in York. Established by John Graves Simcoe in 1793, it was used both by Fort York and the civilian population that lived in the Town of York at this time. The first known burial at the site was actually that of Simcoe’s own daughter, Katherine, who was buried there in 1794. It’s possible that some of the dead from the Battle of York in 1813 were buried in this cemetery, although no direct evidence exists to verify this. In later years, however, bodies of Battle of York casualties were sometimes uncovered elsewhere in the city, as many of the slain had been buried near to where they fell. At least one of these bodies, that of Captain Neal McNeale, was relocated to the Military Burying Ground after the body was found near Humber Bay in 1829. In Historic Fort York 1793–1860, historian Carl Benn writes that, shortly after Battle of York, the town became a hospital centre for those fighting along the Niagara Peninsula. According to Benn, those who died in York were buried in the Military Burying Ground, which, following periods of heavy fighting, could amount to as many as eight a day. Drawing of the grave markers in the old Military Burying Ground. Evening Telegram, October 4, 1888. In 1863, the cemetery was deemed full and closed to new burials. While there are 344 known plots on the site, many of these plots are believed to contain multiple graves; most estimates put the total number of burials between 400 and 500, with one source suggesting there may be as many as 1,500. Progress on the site was slow. One of the first efforts was an inventory of the remaining markers, noting their location, shape, material, and any remaining legible text. This inventory remains at the City of Toronto Archives today, and includes transcriptions of the wooden markers that were still on site and legible at this time. In 1885, the surviving grave markers were moved to a terrace on the western side of the property. The ground was levelled, and paths were planned for the park. 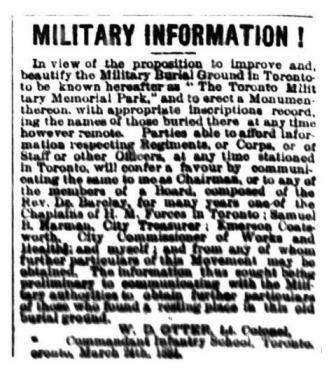 An 1883 letter from the Board’s Lieutenant Colonel William D. Otter to the City’s Property Committee proposes a monument in the centre of the park to the “honoured dead and the regiments and corps to which they respectively belonged.” Otter’s stated goal was “to erect a Monument to their memory, which will be at once the chief and sacred ornament of the ground.” The Military Memorial Park Board placed notices in the Toronto newspapers in 1884, announcing plans for a monument on the site, and inviting people to come forward with information about the identities of those who had been buried there. The cornerstone for the cenotaph was finally laid in 1902, in a ceremony held by the Army and Navy Veterans Association, which by now had assumed control of the project. As was customary at the time, the cornerstone featured a time capsule, including newspapers, coins, and other documents of the day. Those who spoke at the event included Mayor Oliver Howland and composer Alexander Muir, whose speech concluded with the crowd singing his composition “The Maple Leaf Forever.” The newspapers reported that veterans of several wars were on hand for the ceremony, including those who had served in the Crimean War, the Second Opium War, the Indian Rebellion of 1857, the Second Anglo-Aghan War, the Fenian raids, the North-West Rebellion, and the ongoing South African War. That November, another large crowd turned out for the unveiling of the monument’s pedestal. The Army and Navy Veterans again led the ceremony, and the monument was unveiled by Premier George William Ross, who delivered a speech about the significance of the site. “Nearly 500 have found graves within this sacred spot, including the soldiers, their wives, and children. Perhaps no other spot in the Province of Ontario bears more sacred and, shall I say, more distinguished dust.” Ross then turned to the subject of the war itself, noting that “men not only spared neither limb nor life, but, like the Romans of old, neither son nor daughter nor wife in the defence of the country.” Ross’ speech concluded with him leading the crowd in three cheers for the army and navy veterans in recognition of their work in seeing the project through. Victoria Memorial Park, seen in 1913. Some of the original markers can just be seen along the fence. City of Toronto Archives, Fonds 200, Series 372, Subseries 52, Item 192. Despite having the different unveiling ceremonies, it did not take long for the memorial to be overlooked. Empire Day, which for many years was synchronized with Victoria Day, was Toronto’s annual day for recognizing veterans prior to the First World War. At the 1909 Empire Day ceremony at Queen’s Park, Lieutenant Colonel W. Hamilton Merritt addressed the crowd, saying, “There has been no decoration today of a monument to the brave men who saved Canada in 1812 to 1814 and who laid deep and strong the foundation stone of this great Dominion…. I would ask of you…your sympathy and co-operation towards the object of permanently placing here, side by side with these other memorials, a record of the War of 1812–1814 and of the victories there obtained.” Merritt suggested such a monument would be a fitting tribute for the war’s upcoming centennial. Major W.A. Collins, President of the Army and Navy Veterans Association, wrote to the Globe the next week, gently reminding Lieutenant Colonel Merritt that a monument to the veterans of this war had been completed in Victoria Memorial Park just two years earlier. Collins further suggested that “the proposed centenary celebration, if held in 1912, take place there.” But if there was a major centennial event at this park to mark the centennial, no mention of it was made in the Toronto newspapers. 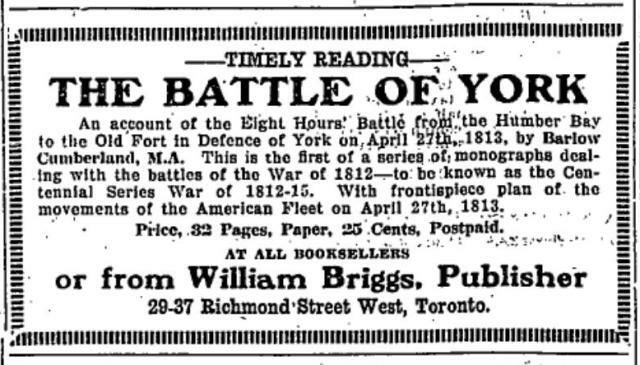 Advertisement for The Battle of York by Barlow Cumberland. The Globe, April 26, 1913. 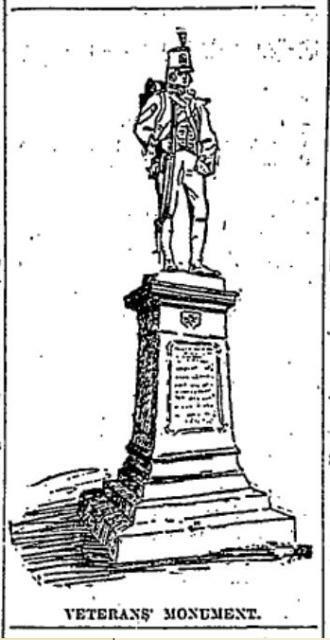 The Star noted that the War of 1812 monument was among those decorated on Empire Day in 1912, but the primary Empire Day ceremonies took place, as usual, at Queen’s Park, where most of Toronto’s other war monuments are. In 1913, the centennial year of the Battle of York, the Star reported that the official Empire Day parade began at the city armouries, passed the other monuments on University Avenue, and concluded at Queen’s Park. Victoria Memorial Park, being considerably west of University, was not on the route. The city’s first major commemoration of the War of 1812 appears to have been in 1934, when Fort York was first opened to the public as an attraction, as part of the City of Toronto’s centennial celebrations. Although separated from main property, Victoria Memorial Park is officially part of Fort York National Historic Site and several interpretive panels on site detail the extensive history of the park. None of the original wooden markers remain, but the 17 surviving original stones were mounted in a new installation in 2010. Together with the cenotaph, they are reminders of our city’s past, which is often so quickly forgotten. 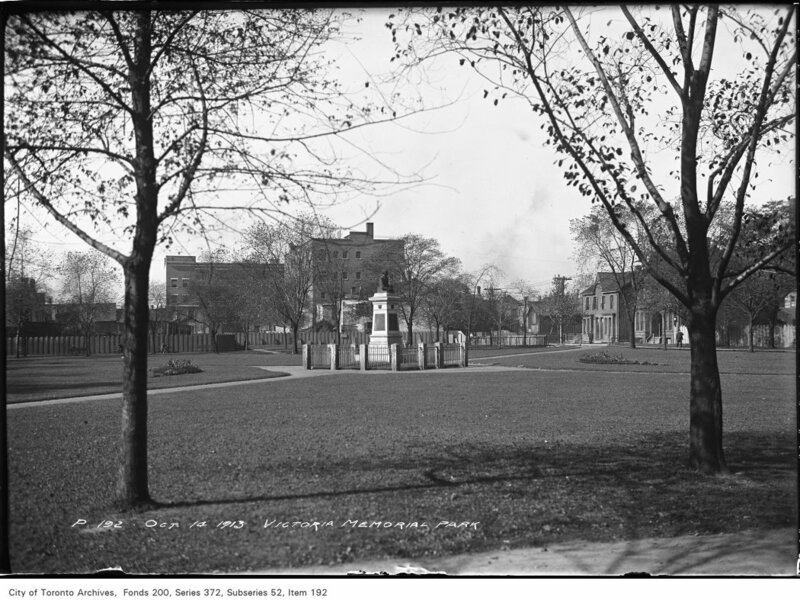 For more on the history of Victoria Memorial Park, see the virtual exhibit “Heart and Stone” on the City of Toronto website. Additional material from: Carl Benn, Historic Fort York 1793-1993 (Natural Heritage/Natural History Inc., 1993: Toronto); The Globe (July 2, November 21, November 22, November 24, 1902; December 29, 1906; January 7, 1907; May 25, May 31, 1909; April 26, April 28; November 15, 1913); Robert Malcolmson, Capital in Flames: The American Attack on York, 1813 (Robin Brass Studio, 2008: Montreal); John Ross Robertson, Landmarks of Toronto [Vol. 1] (Toronto: 1894); Michael J. Rudman, “The History of These Graves” in The York Pioneer, Vol. 94, 1999; Michael J. Rudman, The Old Garrison Burying Ground (1794-1862) (April 1997); Henry Scadding, Toronto of Old: Collections and Recollections Illustrative of the Early Settlement and Social Life of the Capital of Ontario (Adam, Stevenson & Co., 1873: Toronto); Jacqueline Stuart, “The Old Military Burial Ground — Toronto” in The York Pioneer, Vol. 78, No. 1, Spring 1983; the Toronto Daily Star (February 12, November 22, 1902; May 22, 1913); the Toronto Evening Telegram (March 25, 1884; October 4, 1888; July 2, November 22 1902).